So, let’s say that you have chosen the song, taken some time to pray with it and shared it with the pastor, music leader and other pastoral staff. Now, it is time to introduce it to your music ministry. If you have access to a recording of the song, share it before you plan to rehearse it. Avoid the temptation to jump right into the parts, dynamics and details of the arrangement. Read the lyrics before singing the song. If the song is based on a scripture passage, make sure to read the scripture while learning the song. Use the song as a closing prayer at rehearsal. Have your group sing the refrain over and over again. Encourage them to memorize it, praying while they sing. The more you are able to encourage prayer in your music ministry, the better your liturgical ministers will be able to lead the congregation in prayer and song. Now that you have prayed with the song, make sure your group/cantor knows the song inside and out. If any of you are teachers, you understand the importance of knowing the material you’re teaching. On multiple occasions I have had to postpone introducing a new song on Sunday because my choir/cantor were not ready. Try your best to make the song as beautiful, prayerful, engaging, musical, exciting… as possible. Make the song your own. The more comfortable your music ministry is with a song, the better the congregation will respond to learning it. Make sure to plan out how the song will be taught to the congregation. It is easier to learn a song if it is sung by a soloist or cantor the first time. On the weekend you plan to introduce a new song, pick one of your best cantors. Make sure they are comfortable cantoring and have the ability to connect with a congregation. Also, take into account whether they will take the time to prepare and pray with the song. If you normally do not have cantors or soloists, another option would be to have one section of your choir sing through the song first. (i.e. sopranos on the first refrain). I hope some of these tips will help you in your ministry. Above all else, encourage your music ministers to always pray with the music. A music leader guides the people in song, but a music minister guides the people in prayer. 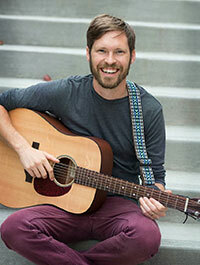 Nichlas Schaal is a gifted musician, music director and composer who is known as a community builder and worship leader in his local archdiocese of Portland, Oregon. For more information on Nichlas and his ministry please visit www.schaalmusic.com.